While I sometimes photograph the groom and the guys in the hotel room as they get ready, when possible I usually prefer to get shots of them in an environment that feels more comfortable and natural to them, such as when they are all just hanging around prior to the start of the ceremony, walking down the street on the way to the venue, or having a drink at the bar, as was the case with this semi-candid shot in Irvin Mayfield's Jazz Playhouse at the Royal Sonesta Hotel on Bourbon Street. They'll tend to be more relaxed in this kind of setting. 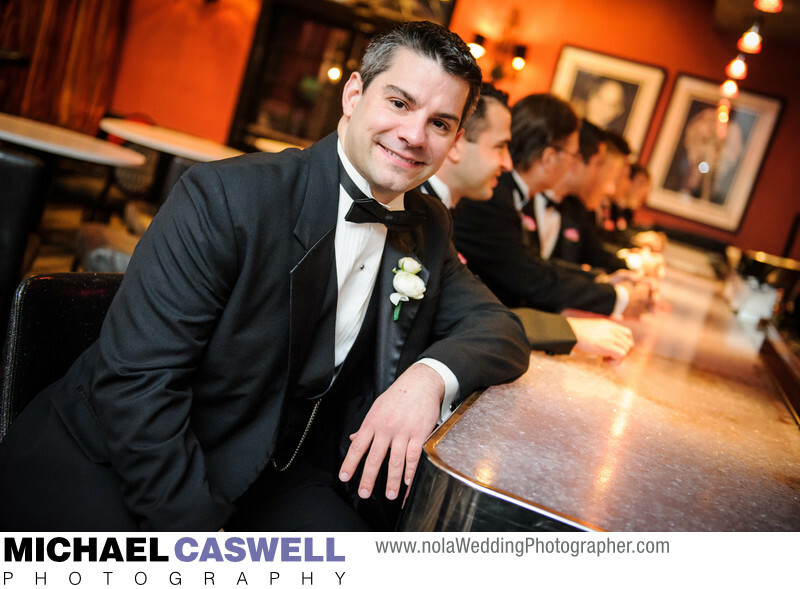 This wedding ceremony took place at Immaculate Conception Church on Barronne Street, just outside the French Quarter, and then everyone was led on a second line parade back to the Royal Sonesta for the reception in the hotel's elegant and spacious Grand Ballroom. For smaller weddings, this venue also has the Fleur de Lis Suite, which is located right off the lush courtyard. Location: 300 Bourbon St, New Orleans, LA 70130.